The New Balance Fuel Cell Impulse is a lightweight trainer/racer geared toward faster running. A lightweight upper holds the foot snugly on the shoe while a close to the ground sole provides good feedback during landings. However, due to the firmer sole, this shoe works best for faster and/or shorter runs. It should appeal for those who land farther forward for uptempo running, track workouts or those looking for a more cushioned racing flat. The New Balance FuelCell Impulse is New Balance’s first attempt at integrating the FuelCell into a faster, uptempo shoe. The Impulse is designed for faster days. Although designed a lightweight trainer, many will find themselves reaching for this shoe for longer races, particularly the half or full marathon. A snug upper is utilized to hold the foot down on the platform during high speed transitions, while the FuelCell is placed in the forefoot to get the turnover going. This shoe rewards a forward landing due to the placement of the FuelCell, the aggressive toe spring and 6mm drop. The FuelCell is a nitrogen infused TPU material that is meant to provide high responsiveness and cushioning. The remainder of the sole is New Balance’s tried and true Revlite material. This combined with flexibility in the right places make this shoe lively for uptempo days or whenever you need to inject some speed into your runs. The mesh upper utilized in the New Balance FuelCell Impulse was not only comfortable and snug for testers, but worked well sockless for many. No blisters were noted, however some did not feel secure enough without cranking down on the laces. Many found the shoe’s extra cushioning to be appreciated for a faster oriented shoe, however the firmer ride limited many to shorter or uptempo runs. Testers noted that a forward landing (forefoot strike) was most comfortable due to utilizing the FuelCell material that was located in the forefoot. Others found the lack of additional cushioning in the heel a bit firm, while some like the firmer landing and fast transition to the forefoot. Testers noted this shoe was not meant to be a highly comfortable shoe and instead one that begs to go fast. However, others noted the additional material made them feel comfortable enough to try to take them out for long distance races with a PR in mind. Testers noted that while the bootie construction of the upper made the New Balance FuelCell Impulse very difficult to get it on the foot, once it was on the fit was very comfortable. The forefoot fits slightly wider with a narrower heel, following the shape of the foot closely. The upper fit slightly short to give a closer and snugger fit for faster running. However wearing thicker socks was a no-go due to the close fit. Testers had difficulty getting the shoe on due to the snug fit and others found the fit a bit compressive initially. As the shoe broke in, many noted it provided a more custom fit as the upper started to relax a bit. The heel and midfoot fit very close to the foot and many were impressed that no major heel counter was needed to keep the back of the foot centered on the platform. Many compared the fit to a slightly relaxed track spike which inspired the feeling of needing to run fast in this shoe. The nitrogen infused FuelCell in the forefoot worked well to provide a high amount of rebound during faster running. Testers found the shoe to be highly responsive that had many running faster even during training runs. The forefoot was noted to have good flexibility, which eased tension on the calf muscles during easy and fast runs. The smooth sole provided good contact with the ground, but many were careful to note that the shoe did not have good traction on wet cement. This had many limiting this shoe to track days. This also lended to testers noting the Impulse getting them up on their toes—again, due to the placement of the FuelCell in the forefoot. Others who landed farther back noted a great toe off but an average heel landing. Those that landed farther forward were rewarded by the forward placement of the FuelCell and the lower drop promoted faster turnover. The New Balance FuelCell Impulse is meant to go fast. All testers found the Impulse to work best at high speeds, especially for fartlek and track workouts. While it isn’t the lightest shoe out there, the Impulse allowed many to go fast without sacrificing protection. It is a fast go-to lightweight trainer/racer that could carry many over a variety of distances from the 5k to half marathon. A number of testers said they reached for the FuelCell Impulse for long track workouts during which they wanted to save their legs. Others began searching their calendars immediately for their next half marathon. Testers agreed this is a fast shoe and not one for recovery days unless you are used to lighter or more minimal shoes. All testers noted a decent ride no matter where they landed. The flexible forefoot combined with an aggressive toe spring and the FuelCell made faster running easy. 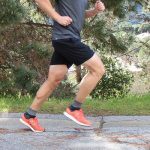 Many noted that despite the firmer ride, they felt protected and were able to turn over easily in this shoe especially during workouts and uptempo runs. However, over longer runs the extra flexibility in the forefoot provided less stability than some preferred. Testers noted that the lack of significant cushioning in the heel, landing farther back could be a bit harsh due to the closer to the ground feel than many other lightweight trainers. The 6mm drop and slight heel bevel kept heel landings somewhat smooth but those with a forward landing still noted the best ride. Testing of our lightweight road shoes was performed by a committee of testers, both male and female. Our group consists of eight testers who wore the shoes for total distances of approximately 20 to 80 miles. 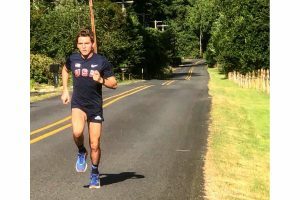 Single runs ranged in distance from three to 26 miles, and included casual training as well as speed workouts and road racing. The majority of our testing is conducted on asphalt roads or all-weather tracks, but we occasionally venture off-road onto jeep trails or smooth trails. Each tester prepares a summary overview of how each shoe performed in the criteria of fit, comfort, responsiveness, ride quality, and speed, and he or she also includes any additional thoughts or observations about the shoes during the test period. Dr. Matthew Klein PT DPT OCS is a doctor of physical therapy and Kaiser SoCal Sport Fellow. He is a long time competitive runner over a variety of distances. He has a keen interest in running shoes and has been researching and reviewing them for almost a decade.